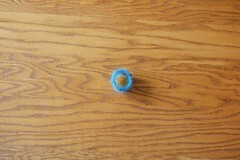 This entry was posted on Sunday, May 16th, 2010 at 5:58 pm and is filed under Knitting. You can follow any responses to this entry through the RSS 2.0 feed. Both comments and pings are currently closed. as usual, your words, your thoughts, and your handknits inspire!! i love your positive message and your beautiful poppies! 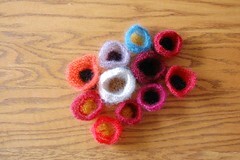 i’m going to do some poppy knitting myself this week… spread the love! 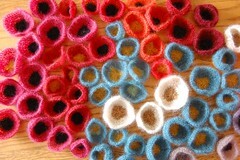 3) Making sure placement of poppies combined with backdrop will make for an “artistic” photo. This project has so many layers to it. I hope it will get your creative juices flowing, while you strive to make a difference. How do your feel about little Clay “terms of endearment” I made little clay pieces stamped symbols of peace,joy,healing,love…. in raw clay to plant and melt into the earth~~~~little seeds of endearment to let the earth know we humans do cherish, and love and care for her and each other. I love knowing you and I cherish and have gratitude for what you are doing. This is amazing! I love your idea. Thank you so much for sharing. I hope you get some pics of you & the poppies in action! THANK YOU for your words, inspiration and wonderful intention. My mother is in the middle of a very tough battle with cancer and I have been feeling helpless and powerless to do anything for her. This is perfect. (I recently bought the poppy pattern), and not only have you inspired me to start making some flowers but you have reminded and shown me by example that there are creative, soul nurturing things I can do to feel better. THANK YOU, my brain and heart are churning with ideas. I am touched by your project. Making the world a beautiful place with you knitting, words of encouragement and your open heart. I am inspired. Stay tuned for what will happen in Boston.